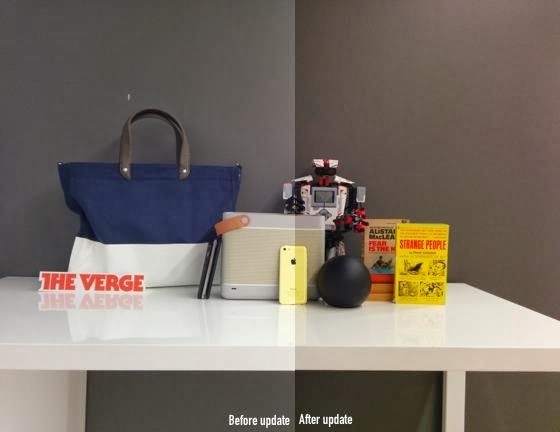 During our test of Nexus 5, we take up as photo / video sensor was rather weak. An update to Android 4.4.1 stamped, will be deployed in the coming days and will come correct this problem. Nexus 5 equipped with a version of Android 4.4.1. It aims to correct many problems on the photo portion of the smartphone. For usage, it is true that it is more than distressing: autofocus may take several seconds to focus, and rendering pictures is flat or dull. Google tells our colleagues that several points have been reworked with this new version of the OS. First, it is actually the issue of development is far too slow with Android 4.4, induced by slow image stabilization. With the update it promised better, clearly the best, but better stitched image, improved contrast, truer white balance, etc.. Brief from The Verge, it is the day and night, and it makes much more acceptable photo sensor. We will try to confirm or not this judgment soon. A change has also been made on the HDR + mode. A progress bar will now appear when using the functionality to make it more intuitive. But this is only the first change that will appear in the interface of the Camera application. Others should follow to make it easier to use. So wait for this update, which is permitted for the coming days.